Created by Knowledge Admin on Feb 11, 2019 12:02 PM. Last modified by Knowledge Admin on Feb 11, 2019 12:04 PM. How to load Server groups on Live Reporting if it is showing empty or not showing all the groups? You must refresh the list of server groups (static groups or smart groups) so that Live Reporting will include information for the appropriate groups of servers. Remember to do this each time the server groups have been modified or new server groups have been created. For more information about this BLCLI command, see Utility populateServerGrpforLiveReporting. In the Live Reporting dashboard, check the Server Groups drop-down list in the Filters section, and ensure that the list reflects the appropriate server groups. 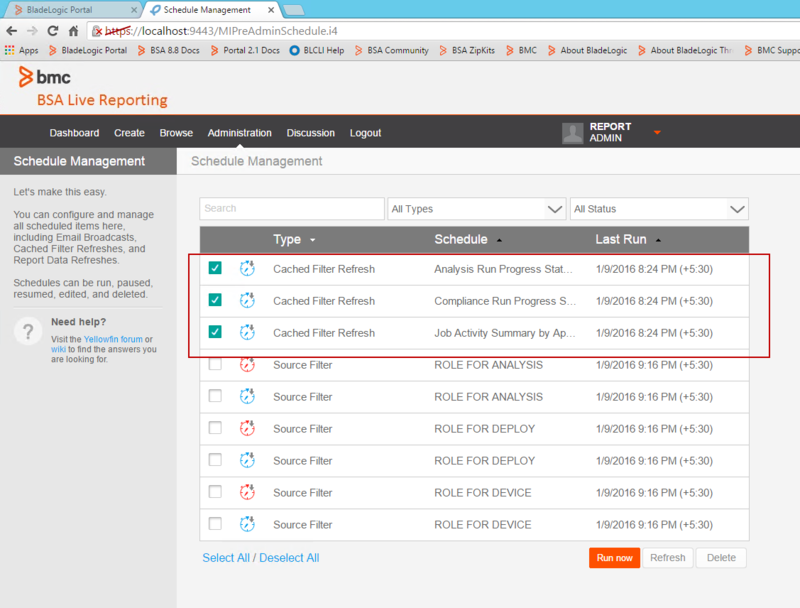 After you add server groups, patch catalogs, and so on to your environment, you need to refresh the cached filter list to ensure that the latest values are reflected in the dashboards. From the Administration section on the right (outlined in red below), select Schedule Management. Click the Refresh button at the bottom of the page (next to the Run now button) and verify that the Cached Filter Refresh items (outlined in red above) show a current date. 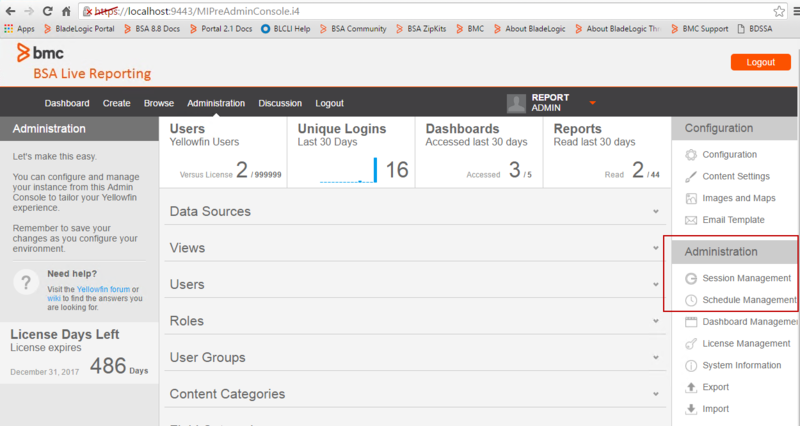 Launch the Live Reporting dashboard from the BMC Server Automation console or from an external browser. Ensure that the expected filter values are now shown in the dashboard.